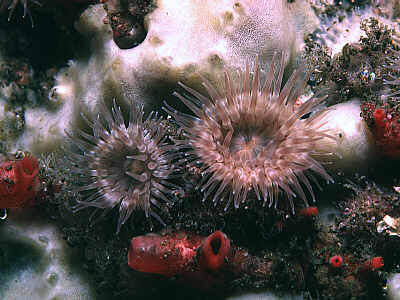 Description: This sea anemone has an adherent base; the column is taller than wide, divided into scapus and scapulus. The scapus is covered with tough horn-like cuticle which itself is often encrusted with algae, debris, bryozoans or tube-worms; beneath the cuticle the scapus bears dark, conical solid tubercles, varying in size. The tentacles are moderate in length, irregularly arranged. The disc has a dusky pattern, the tentacles are vaguely banded. Disc and tentacles are orange, red, brown, or grey - usually variegated. Size up to 50mm tall, 30mm across tentacles. Habitat: Typically occurs on rocks in the kelp zone in very exposed situations, usually on vertical surfaces, from lower shore to 30m. Distribution: Known in the British Isles from northeast Scotland to western Ireland. Elsewhere from Norway and Iceland. Please notify any new records. Similar Species: Acontia are present but are not extruded through the column wall, but sometimes through the mouth. Reproduces by basal lacerations. Several Hormathiids - Cataphellia brodricii, Hormathia coronata - possess tubercles and cuticle but in these the tentacles are arranged in multiples of six and pattern on disc and tentacles is different - compare photos. Phellia is very different from other Sagartiidae. Column with tough cuticle, often incrusted with other organisms. Picton, B.E. & Morrow, C.C. (2016). Phellia gausapata Gosse, 1858. [In] Encyclopedia of Marine Life of Britain and Ireland.